Gianni Versace was one of the first designers who understood the importance of creating a brand that had a true lifestyle value. Since then, Versace has not only been just synonymous with clothes, but, most importantly, with a state of mind. 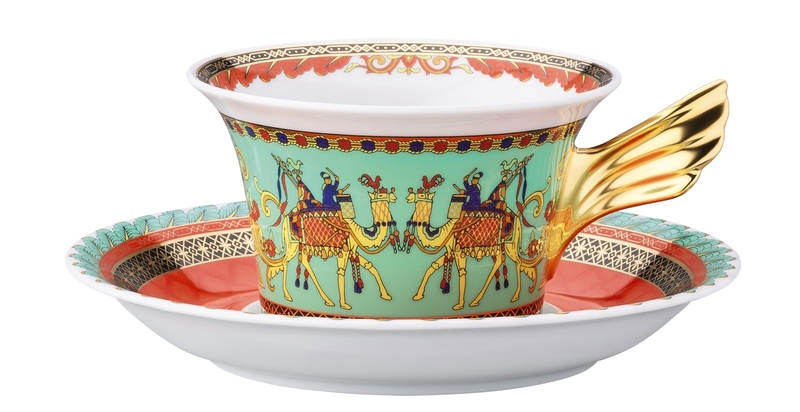 This year, Versace and Rosenthal celebrate the 25th anniversary of collaboration between two of the most renowned brands in their respective fields. A partnership that has seen the birth of many finest porcelain collections enriched by some of the most iconic Versace prints. 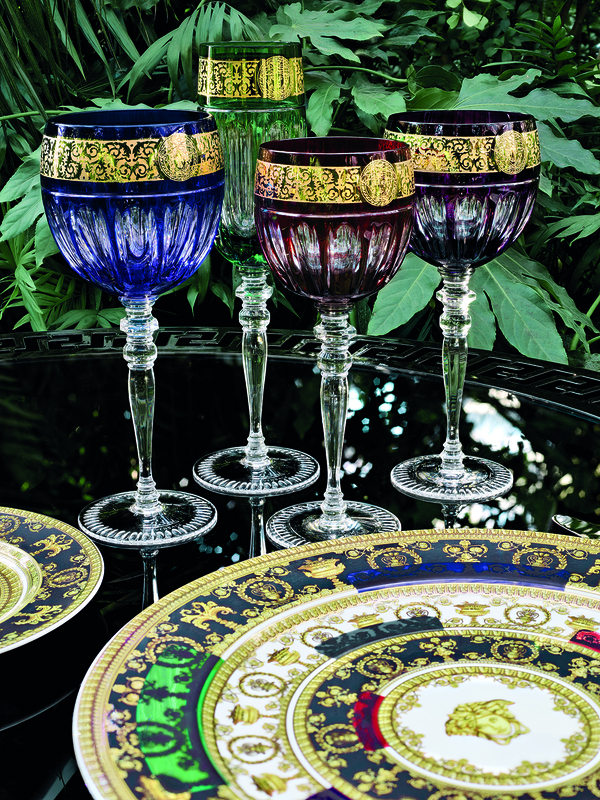 Rosenthal meets Versace first adorned the tables around the world in 1992, under the creative direction of Gianni Versace himself. He believed that, “Versace is a lifestyle and it should be an all-embracing decision for those who choose to adopt it”. Gianni’s genius has brought the Rosenthal meets Versace designs into the future under the Artistic Direction of Donatella Versace. Her vision of the brand’s fashion collections is reinterpreted on the quintessential tableware motifs, making them instantly recognizable. 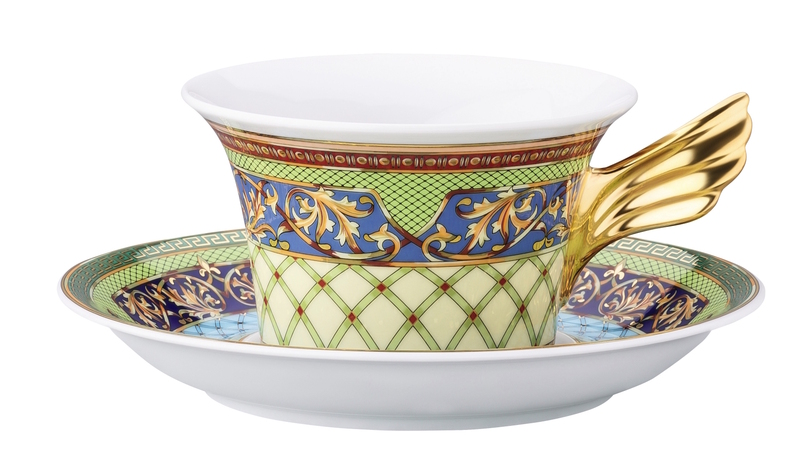 In celebration of the 25th anniversary, Rosenthal meets Versace issues a Limited Edition of special pieces: 25 plates and tea cups featuring 25 different, legendary designs that made the history of this extraordinary collaboration, in which time, history, myth and culture are forever interwined. 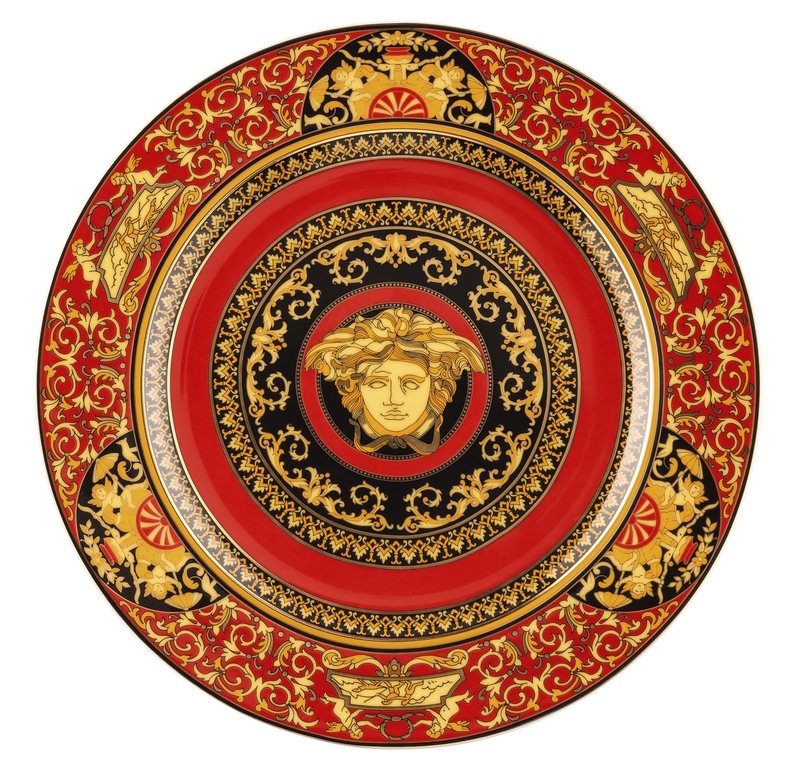 The “Medusa” decor by Gianni Versace reflects the unmistakeably rich, colour-intensive world of Versace. The main focal point is a magnificent gold-coloured Medusa head, surrounded by expressive baroque decorations and truly aristocratic colours. The “Marco Polo” collection evokes both a desire to travel and wanderlust. The decor symbolises a wonderful journey through atmospheric magical landscapes with birds of paradise, camels and peacocks. The background coloured in jade, green and orange is accentuated by swabs of gold and blue. Versace‘s motif “Le Roi Soleil” awakes memories of Roman mosaics, Pompeian murals and not least of his voluminous silk scar ves: a few moresca dancers, a little Inca king, a little courtly envoy, surrounded by baroque-style festoons, griffins and the sun mask. Purism is out, opulent extravagant design is in. 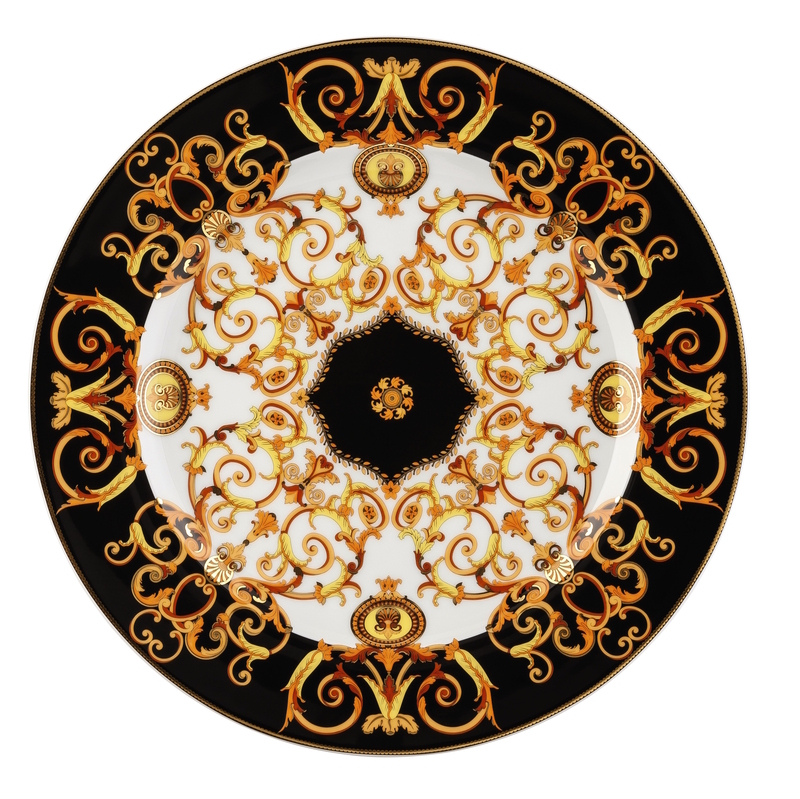 The “Barocco” service displays sumptuously designed patterns from the baroque era in tones of black and gold. The design employs a style element frequently adopted by Versace: The rocaille. 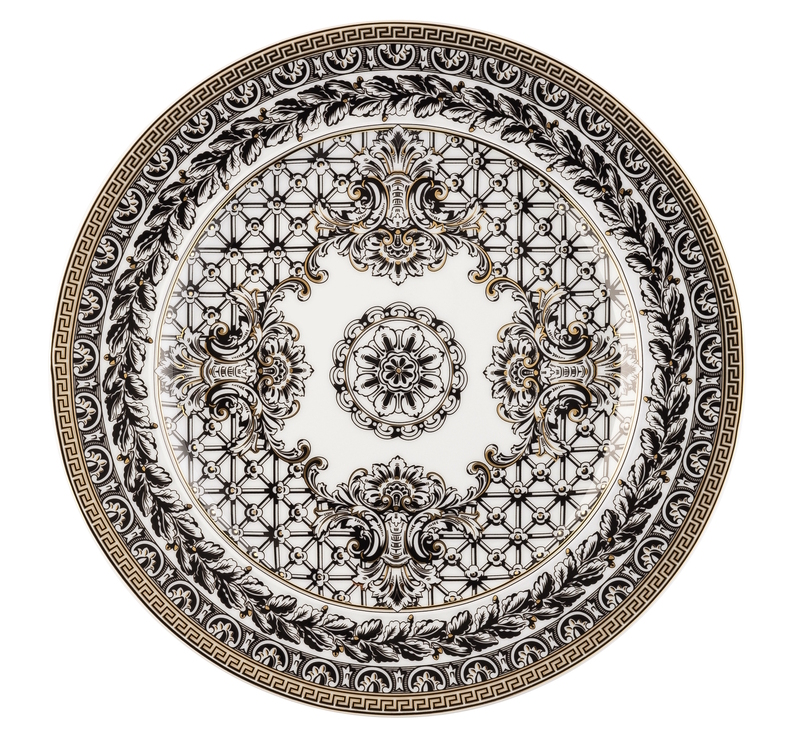 Volutes and acanthus patterns adorn antique temple friezes; a medallion draws the eye to the centre of the plate. 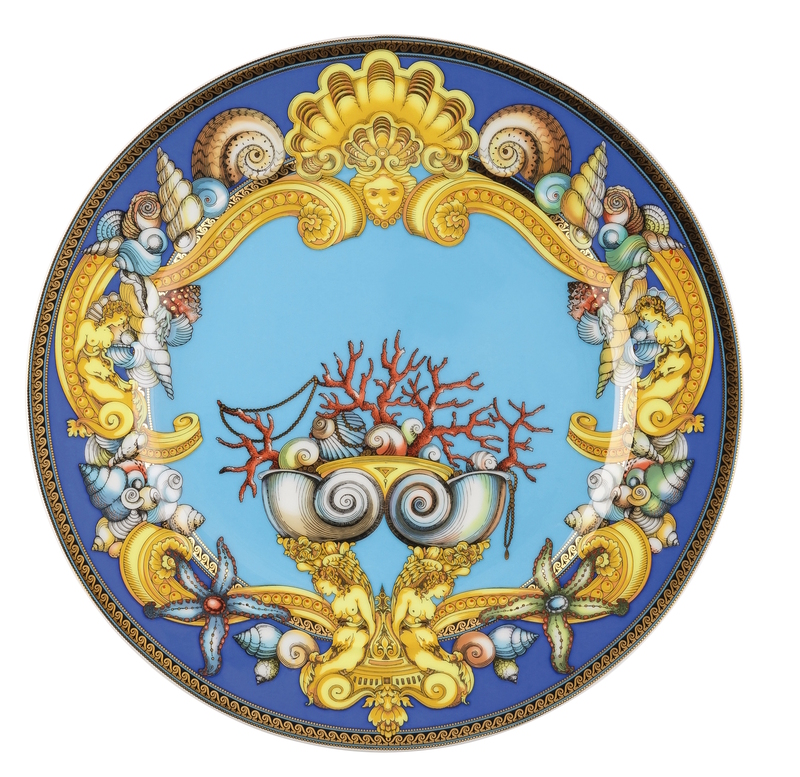 Starfish, mussels, sea snails and corals in a variety of shapes and colour tones, nereides, baroque volutes, frieze ornaments and sea-shells, set delicately in gold adorn the set. 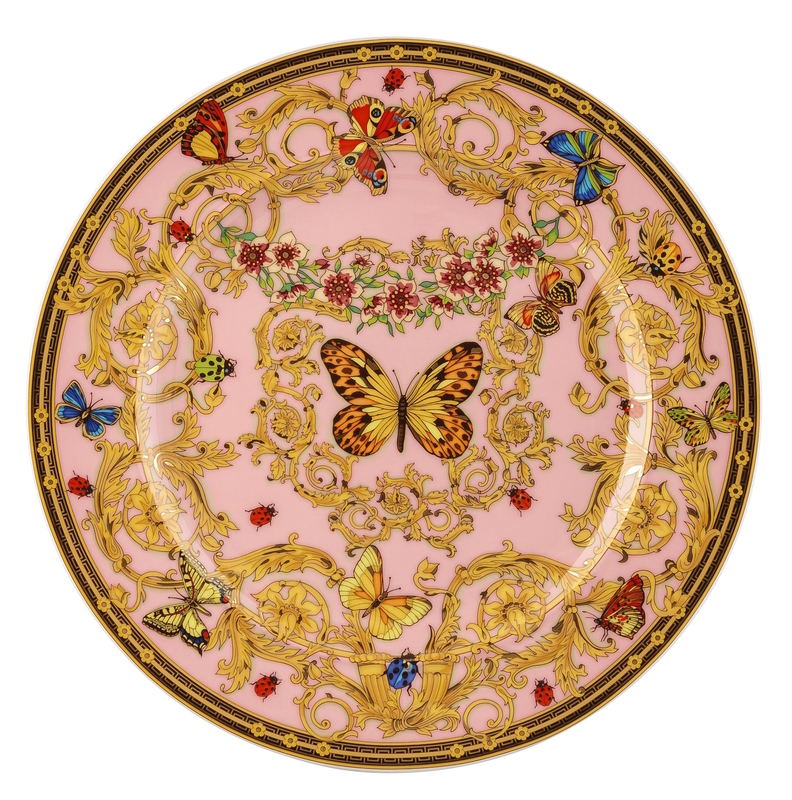 Colourful flowers, butterflies fluttering and swirling ornamentation drawn from another epoch decorate the plates and cups and remind of the sumptuous gardens in Louis XVI style: “Le Jardin de Versace” is a romantic porcelain dream. 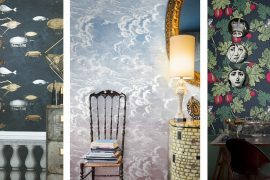 Delicate turquoise and deep red, lots of gold, different shades of blue and green all lend the pattern a lightness of being that evokes springtime feelings perfectly. The traditional baroque patterns are stylistic elements that are consistently repeated in the Versace designs. The “Gold Baroque” collection adopts these patterns once again with lucid baroque tendrils and ornaments in yellow and gold set against a fine black background. The “Gold Ivy” decor by Gianni Versace is held in fashionable black. With its unique combination of up-to-the-minute trend colours with naturalising plant ornaments from the Hellenistic-Roman Art period “Gold Ivy” evokes a desire for eye-catching luxury and effectively interprets the contemporary. With fine motifs and an opulent, colourful diversity “Russian Dream” is reminiscent of the works by Fabergé, transferred to modern times. Glittering turquoise with a diamond pattern in various tones of blue alternates with a classic meander pattern in dark red on an underlying rosé-coloured ribbon. 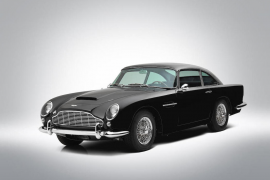 The decorative ornaments and leafy tendrils are held in the finest gold. With the decor “Marqueterie” Donatella Versace has succeeded in combining the opulent Versace style with a new, unexpectedly simple elegance. The famous Versace colours are replaced by black and white, the ultimate contrast. The pattern is characterised by filigree, lavishly detailed ornaments, opulent motifs from the baroque era and well-known design elements from the House of Versace. A luxurious, summery floral arrangement in fine gold and yellow tones on a night blue background adorns the series “Floralia Blue”. The “Medusa” decor is pure Versace: rich ornamentation, a fantastic mixture of baroque and classic styles, strong colours, lots of gold and repeated appearances by the Versace Medusa head. 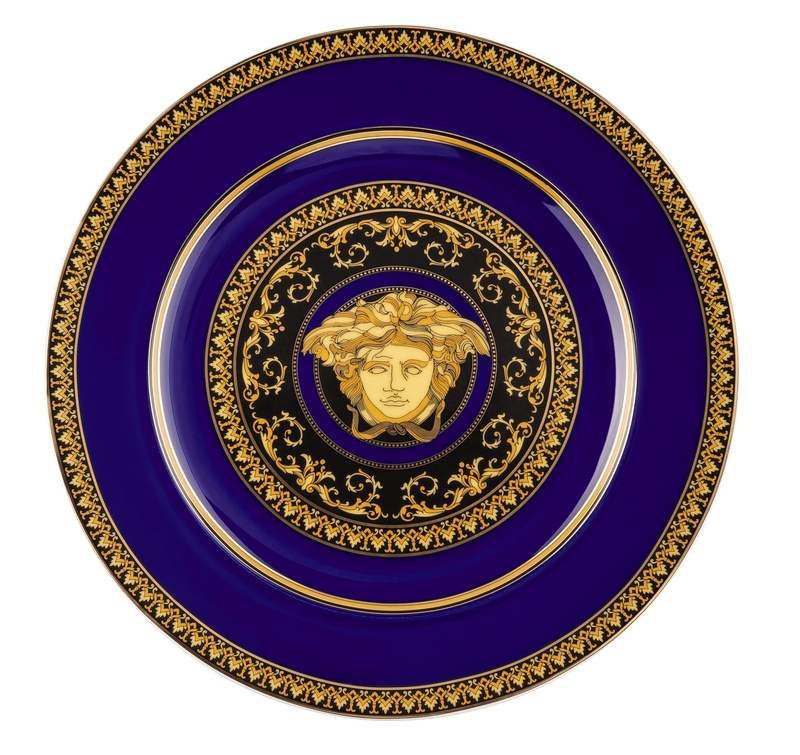 Royal blue, the original colour tone from the Versace Home Collection, places the “Medusa” collection in a new noble and classically elegant setting. Gianni Versace celebrated the rebirth of baroque in the late 1980s. 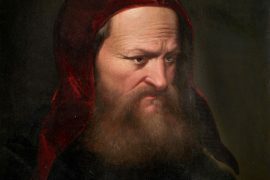 He transformed the traditional patterns into wild pop art designs and replaced the angels and cherubs from Italian frescos with golden chains, Medusas and leopard skin. 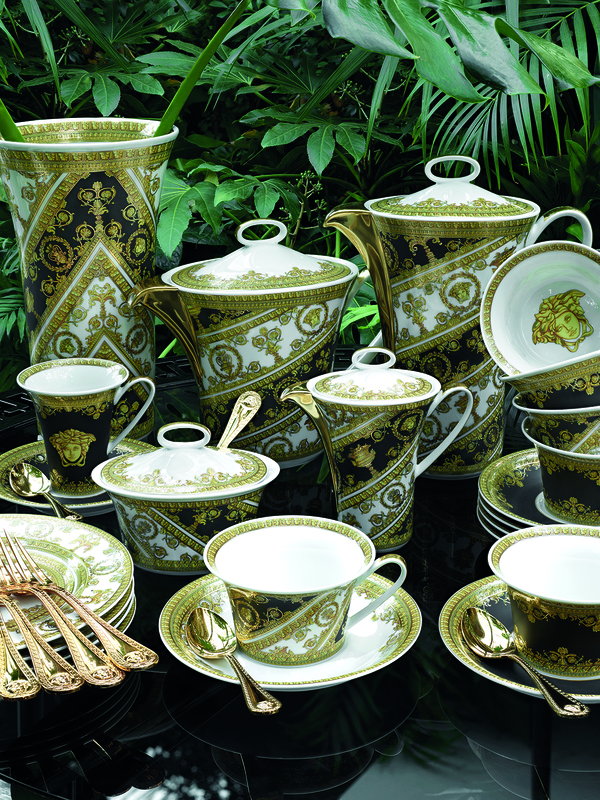 The flamboyant leopard pattern is edged with golden baroque elements. The splendour of “Floralia Green” is formed by an unmistakeable and luxurious style, inspired by the ancient world and the Italian temperament. 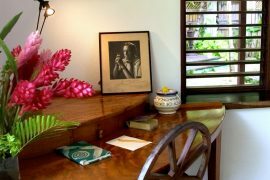 Influences from different cultures merge to create an extraordinary design; style elements from several eras join to form a lively, modern lifestyle. 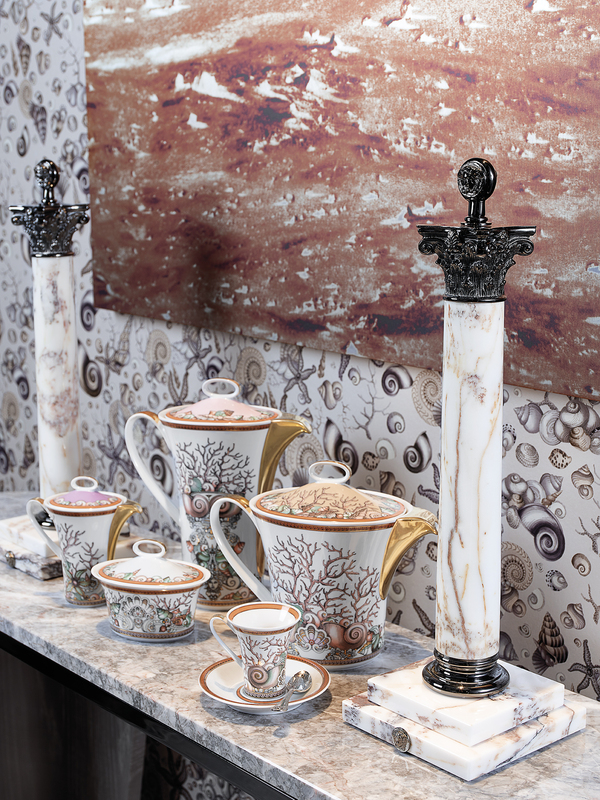 The decor is characterised by three “layers”: The focus of attention is a “Toile de Jouy” pattern designed exclusively for Versace. 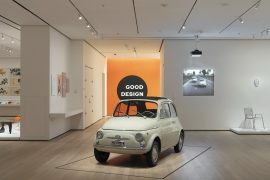 The design with its green shading recalls Versace’s head office in Via Gesù and Villa Le Fontanelle, on Lake Como. 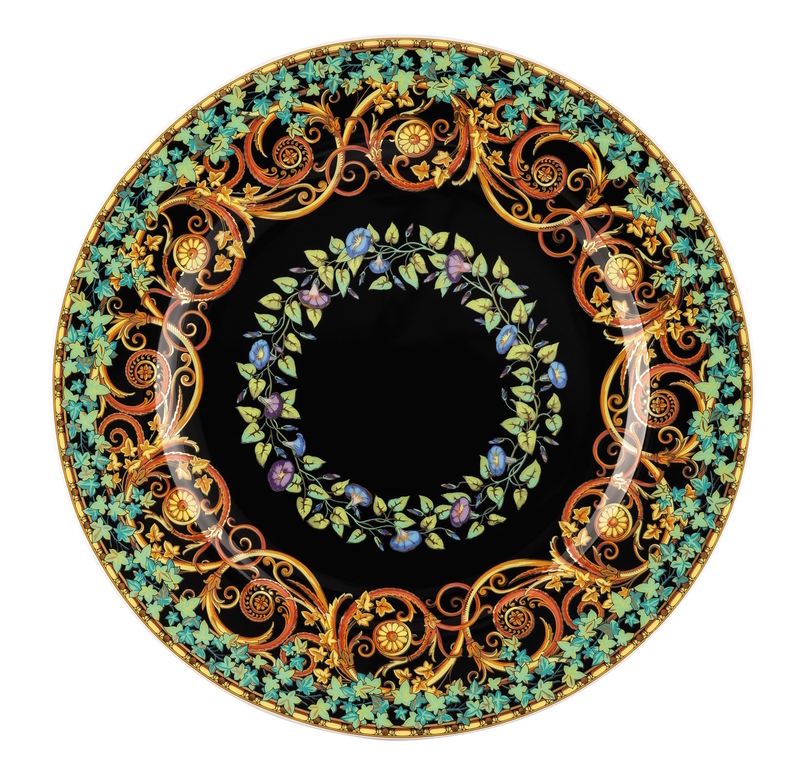 The central motif is a portrait by Donatella that depicts a humorous allusion to her role in the company’s history, set in a medallion bearing her initials. Magnificent pink and yellow orchid blossoms round off the collection. Poppy blossoms, delicate orchid tendrils and colourful floral splendour: “Primavera ” evokes springtime feelings. The motif is pure Versace: Opulent ornamental baroque designs, rich colours and frequent application of the Versace trademark, the Medusa head. The underlying tones are strong blue, intense yellow and red. It is both the most famous motif and also an original design by the legendary Gianni Versace. The “Vanity” service is a “must have” for all lovers of the typical Versace opulence. 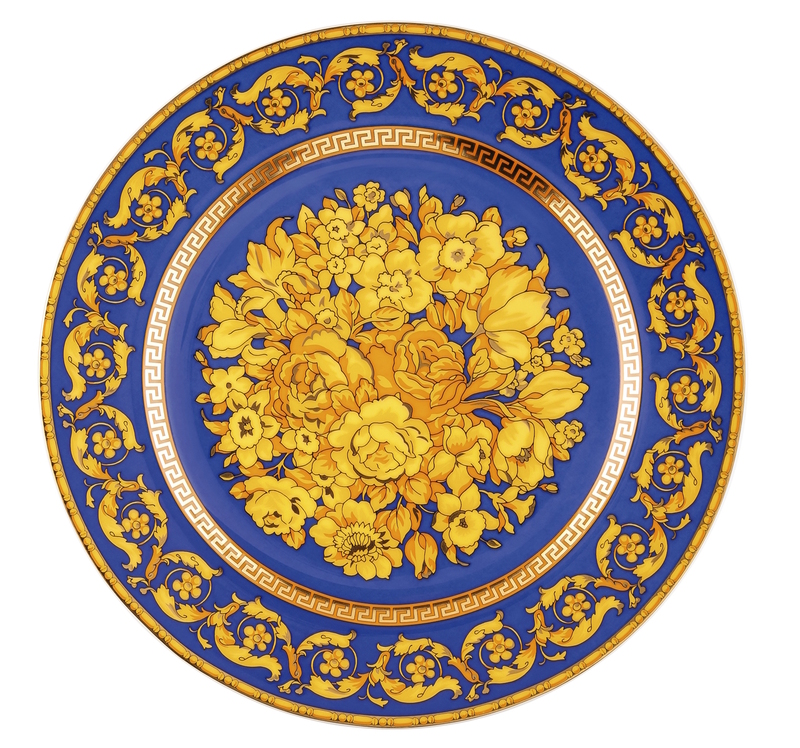 The decor – with the typical baroque colour combination of dark blue and gold tones – is reminiscent of the delicate inlay work typical of Baroque varnished furniture. A composition by Donatella Versace that echoes both the magnificent ornamentation from the ancient ‘Byzantine’ era and the legendary world of ‘Arabian Nights’. “Les Rêves Byzantins” is a rediscovery of historic and exotic influences and matches the opulent baroque motifs of the Maison with iconic symbols of medieval art. The name of this collection echoest he fabulous opulent parties held at the French Royal Court of Louis XIV and it refers directly to the first magnificent Ball that celebrated Versailles as official Palace. 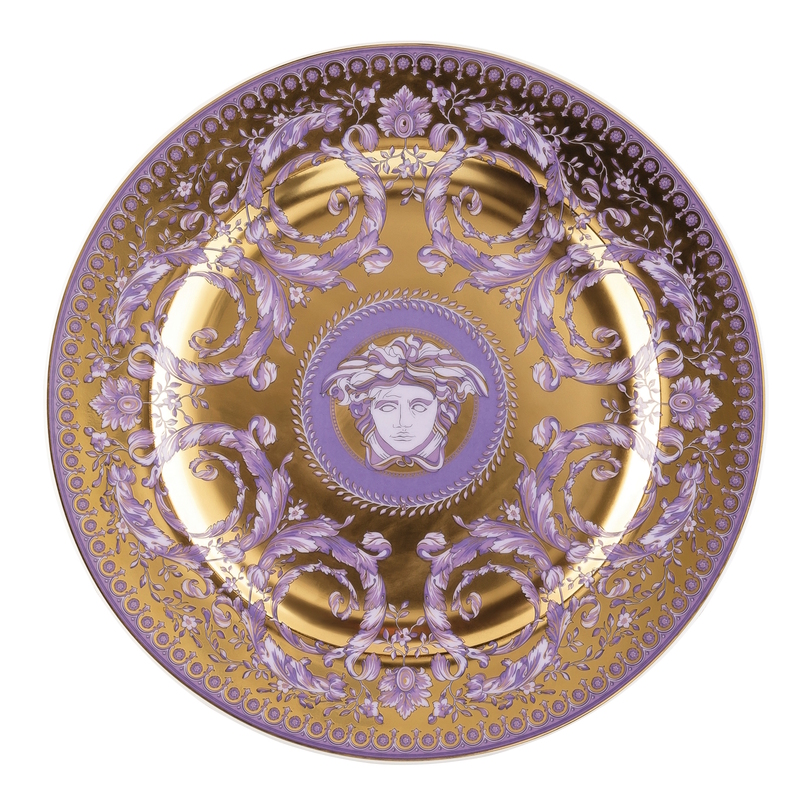 The motif “Le Grand Divertissement” – Versace’s legendary arabesque design – is presented in intense purple on a golden background. A red dragon, the most legendary figure of Asian mythology, rises majestically in the middle of the service plate, conveying all his might and glory. 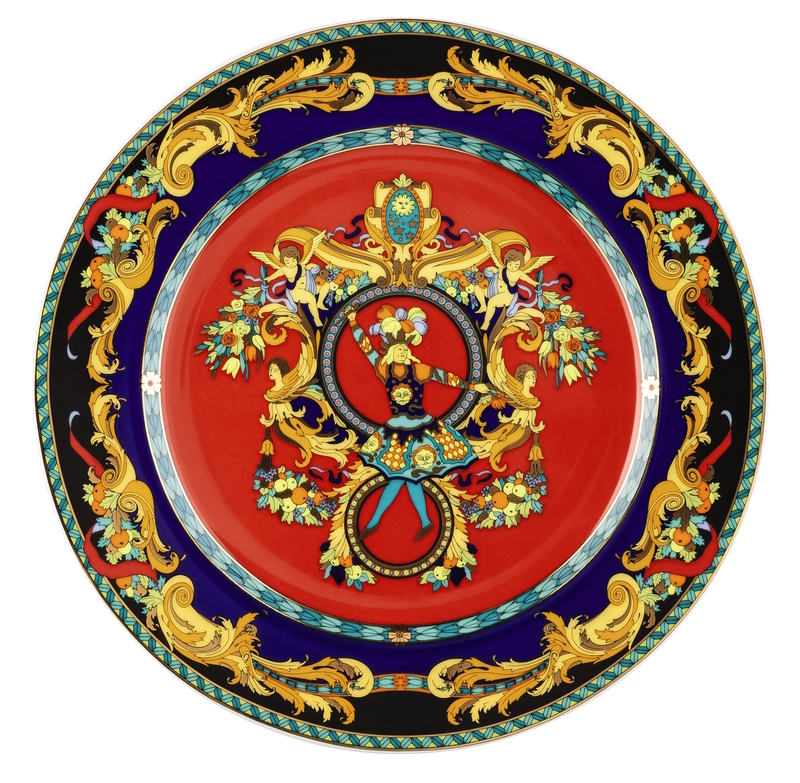 Opulent golden baroque patterns, four small medallions representing the sun and the Versace Medusa decorate the background, while a red frame borders the plate. 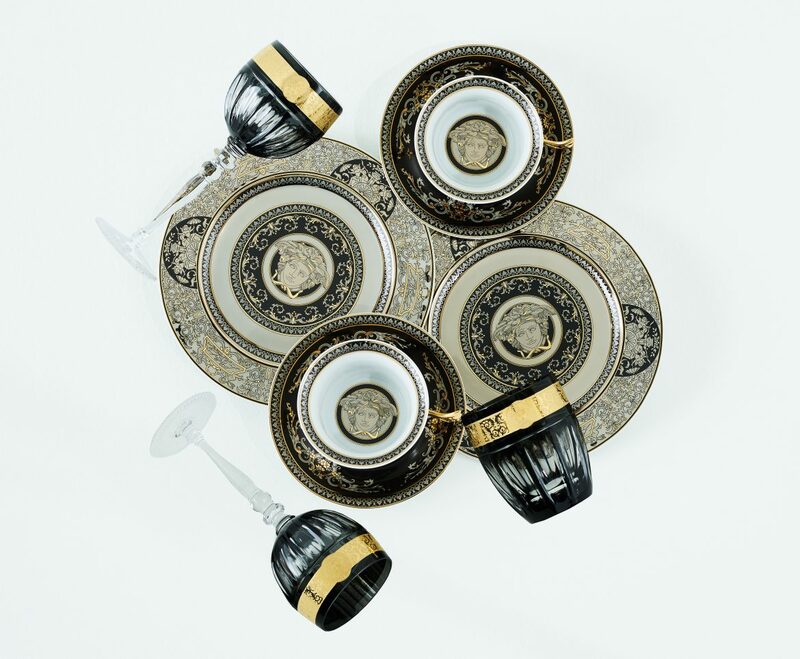 Inspired by the ambience of opulent dinner parties, the design replicates the traditional Versace motifs: the iconic Medusa head and intricate Baroque ornaments adding an exciting contrast of white and gold to create a contemporary table arrangement. 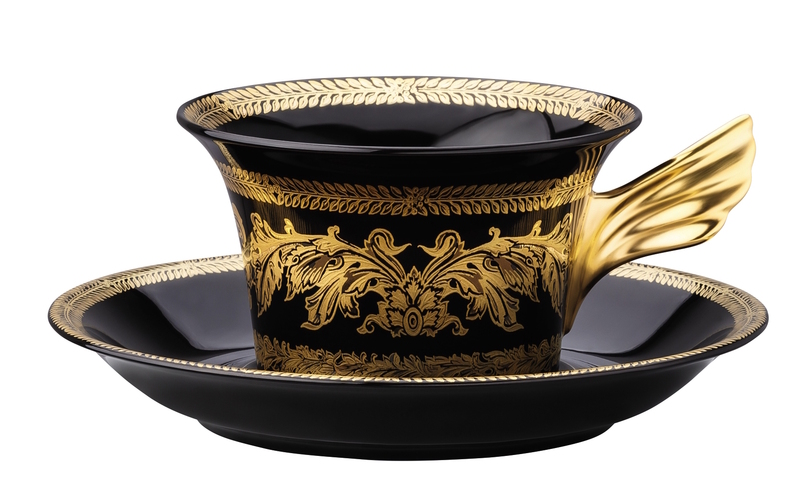 The “Medusa Gala Gold” line, adorned with a full-faced gold plume and ribbon motif, is even more luxurious. Gold baroque elements and a bold silver Greek key frame a luxurious vase and two imposing lions – the eloquent details of the “Prestige Gala” collection. Inspired by the iconic Versace print “Le Vase Baroque”, the design is enriched by gold and platinum embellishments, emphasized in black and turquoise. 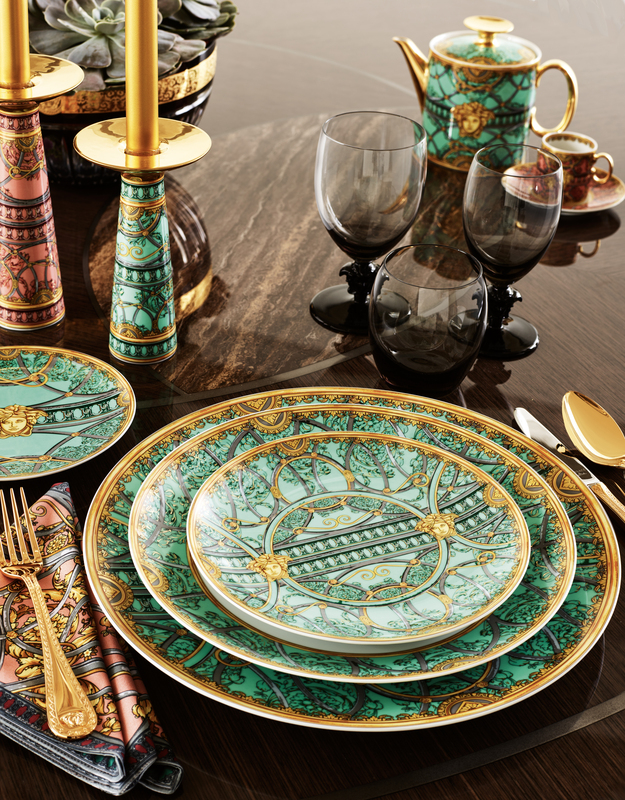 A fresh new take on the iconic “Les Trésors de la Mer” dinner set. The symbols from the depths of the sea – shells, starfish, pearls and corrals – are rendered in a delicate color palette of light grey and ivory, framed by a vibrant orange. An instant classic, the mix of tradition with the contemporary is true Versace, and makes the pattern both seasonless and timeless. The legacy of Versace and its fascination for glorious epochs remains opulent yet renewed in a pure style, making the new “I love Baroque” collection enduring and timeless. It reinterprets the heritage of the Maison with refined decorations of the Baroque era in signature tones of black, white and gold. The majestic marble staircase of the Palazzo Versace in Milan is the inspiration behind the opulent new “La Scala del Palazzo” design. Bold yet refined architectural elements are cut through with shimmering metallic spirals, unveiling the hidden beauty and the legacy of the Maison’s historical building. 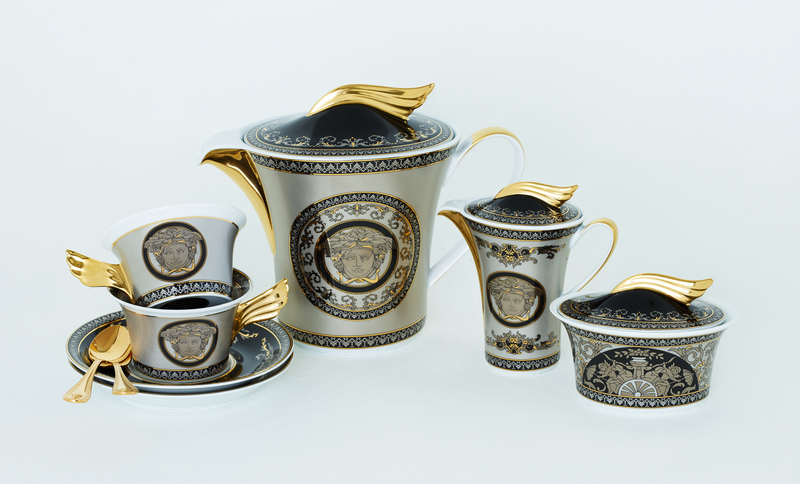 The Rosenthal Meets Versace 25-year collaboration is celebrated with a special edition tea set featuring the powerful Medusa symbol dressed in silver for this unique occasion. 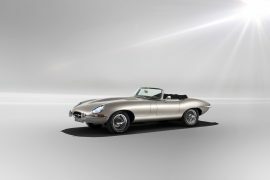 Finely crafted precious gold and silver strikingly interplaying between shiny and powder-mat surfaces. The iconic Medusa, the central element that strongly expresses what this collaboration has always been about: a perfect match. 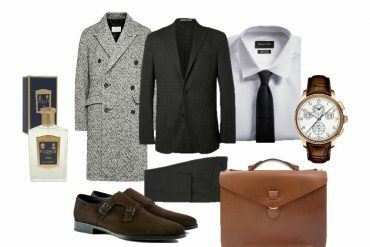 The Gentleman, thank you for your blog post.Really thank you! Awesome.